Naming 5 players never to play first grade again! 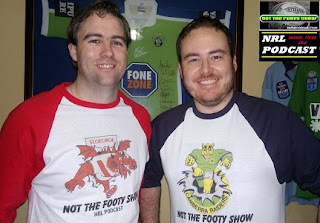 Get your full Round 2 Recap with NOT The Footy Show's NRL Podcast. Matt Duncan and Warrick Nicolson team up to dissect all the action from Round 2, where 5 of 8 games were won by the underdog. The Dream Team Dribblers return with Adrian McMurray and Jake Hauritz discussing the Corey Parker conundrum. Get all the NRL Tweet Player of the Year Votes and find out why your team won or lost this weekend. We also update the panel's Special Fried Rice results and their tipping results for Round 2. We'll be back on Wednesday night for our Round 3 Preview Show.